It has been 95 years since the tragic events in Baku, Samaxi, Quba and other Azerbaijani cities and villages, where Armenian nationalists and communists carried out massacres of Azerbaijani civilians in 1918-1919. It was no accident that Armenian nationalists chose the eve of the Novruz holidays in 1918 as the starting date of the mass extermination of the Azerbaijani population (by the old calendar). In March-April 1918, Armenian formations led by Shaumyan wiped out more than 50,000 Muslims in a short time – Azerbaijanis, Lezgins, as well as Jews and people of other nationalities. People were buried alive, killed, brutally tortured, locked up in mosques and burned. In the courtyard of Taza Pir Mosque in Baku, Armenian bandits collected corpses and made a bonfire of them. In the book "Bloody Gorge", historian and Lezgin poet Muzaffar Malikmammadov writes that Armenian forces carried out four bloody raids on the northern regions of Azerbaijan alone. They involved more than 8,000 heavily armed Armenian militants. 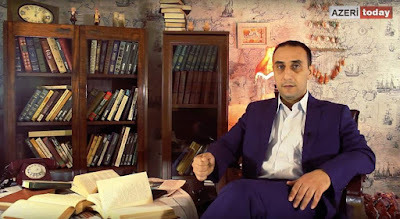 Malikmammadov notes that the main purpose of Shaumyan and his entourage was to exterminate and expel the local population in order to create an Armenian state in the territory of Azerbaijan. This plan was carried out in several regions of Azerbaijan: Karabakh, Samaxi, Quba, central districts, in the south, as well as in Zangazur, Erivan Province and other regions inhabited predominantly by Muslims. Dashnaks wanted to create an Armenian state or, at least, their own autonomous communities, including in the north of Azerbaijan in areas bordering on Russia. Fortunately, the dedication of the local population and self-defence forces did not allow these insidious Armenian plans to be implemented at that difficult time. A real war was unleashed, in which more than 16,000 local residents were killed in a short time and nearly 5,000 Armenian soldiers and militants were liquidated. Dashnak Stepan Shaumyan, who disguised himself with ideas of communism, was the main organizer of the mass murder of civilians, because power in Baku and other provinces was concentrated in his hands. After the February Revolution of 1917, Shaumyan was appointed chairman of the Baku Council, and in December - extraordinary commissar for Caucasus affairs. From April, he was chairman of the Baku Council of People's Commissars (CPC) and commissar for foreign affairs. That is to say Shaumyan was the representative of Lenin and Soviet Russia in the whole of the Caucasus, including in Turkish lands occupied by Russian troops at the time. Thanks to this, Shaumyan skilfully used the situation: the decline of tsarist Russia, the anarchy in the Caucasus and the end of the First World War. After the war, Shaumyan, as a person who was responsible for ensuring the withdrawal of Russian and Armenian military units from the Turkish and Balkan fronts, sent tens of thousands of heavily armed Armenians to Baku, Ganca, Erivan and other cities. Moving on Azerbaijani soil, the well-armed and trained Armenian groups started a real terror campaign and mass murder of the Azerbaijani, Turkish and Muslim population. According to rough estimates, in 1918-1919 alone, Armenian nationalists killed about 500,000 civilians in North and South Azerbaijan. According to Azerbaijani and Russian archives, residents of 162 villages in Quba, Davaci and Xacmaz were killed in the north of Azerbaijan in 1918 alone, while 27 villages disappeared completely. That is to say the leaders of the Armenian nationalists took advantage of the havoc during World War I and carried out their plans to create a "Greater Armenia". This is confirmed by the fact that along with Shaumyan in Baku and other cities, the mass extermination of Azerbaijani civilians was also carried out by the Dashnak leadership of the Ararat Republic in Zangazur, Erivan Province and parts of South Azerbaijan. That is to say led by Shaumyan, relying on Soviet rule, Lenin and using the navy, air force, artillery, choice and well-armed Armenian units, the Dashnaks cynically exterminated the population of Baku and other cities. A trail of blood was left in Azerbaijan in March 1918 by the leaders of Red Guard terrorists Ovchiyan, Galstyan, Artak, Akopov, Manucharov, Armenian "military chiefs" T. Amiryan, S. Lalayev and Hamazasp. This list could go on. "Every time we study the tragic and sorrowful pages of Azerbaijan history, we encounter the fact that, along with Azerbaijani brothers and sisters, victims of the enemies who tried to take over our common homeland were members of the country’s Jewish community. Back in the 1980s, I discovered previously unknown facts about the mass extermination of the Jews, which took place during the genocide of the Azerbaijani people in 1918-19. According to eyewitnesses and separate documentary fragments, up to 3,000 Jews were killed together with Azerbaijanis." One of the facts that prove the atrocities of the Armenian nationalists is the mass grave of women, children and old people killed by Armenian vandals in March-April 1918, which was discovered a few years ago in the city of Quba by the Gudialchay River. The grave was accidentally discovered in 2007 and research revealed that while massacring the local population here, Armenian bandits used sophisticated torture and brutality. According to the facts revealed by the Institute of Archaeology and Ethnography of the Azerbaijani National Academy of Sciences (ANAS), many skeletons had no skulls and some of the victims died from numerous axe blows, and in some of the cranial bones nails driven into the temples and skulls of the victims were found. To sum up, we must say that all the above should not be seen merely as an attempt to evoke pity and compassion for the innocent victims of the events of 1918-1919. Our goal is to show the world community once again the ugliness and brutality of nationalism, in this case, Armenian nationalism, and also to remind everyone that Armenian claims to Azerbaijani lands were always implemented through the mass extermination of Azerbaijani civilians. Azerbaijan does not want a repeat of such tragedies and will not allow the contemporary Armenian nationalists, who govern the occupier country Armenia, to continue the policy of genocide and ethnic cleansing in the territory of Azerbaijan in order to recreate the mythical "Greater Armenia". According to rough estimates, in 1918-1919 alone, Armenian nationalists killed about 500,000 civilians in North and South Azerbaijan. S. Ikhiilov: "According to eyewitnesses and separate documentary fragments, up to 3,000 Jews were killed together with Azerbaijanis (during the genocide carried out by the Armenians - editor)"